Leukoplakia is a condition in which white patches form on the tongue, the gums, the bottom of the mouth, or the lining of the cheeks. Leukoplakia patches cannot be removed through brushing or scraping. It can take weeks for leukoplakia to develop. Many of the cases of leukoplakia do not result in long-term damage to the tissues of the mouth. In certain cases there may be a link between leukoplakia and some types of oral cancer. In the presence of oral cancer, it is not uncommon for the cancer to form near leukoplakia patches. Fortunately, most cases of leukoplakia are benign. 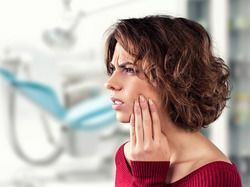 Because leukoplakia may be a sign of a more serious problem, patients should seek treatment for the condition in a timely manner. To ensure the overall oral health of patients visiting their oral surgery practice in Cocoa Beach, Drs. Bird and Johnson offer leukoplakia treatment. By ridding the tissues of the mouth of irritating, aesthetically displeasing, and potentially dangerous leukoplakia patches, oral surgeons Gerald Bird and Jay Johnson help to ensure the continuing oral health of their patients. The symptoms of leukoplakia may vary from patient to patient. Patches may appear on the tissues of the cheeks, the bottom of the mouth, the tongue, or on the gums. The patches may be white or gray in color. It is common for leukoplakia patches to have a hardened or thickened raised surface. In some cases, leukoplakia patches may also have small red lesions. Leukoplakia patches that are accompanied by red lesions may be a sign or oral cancer. The symptoms of leukoplakia should not be ignored. Sores or other problems affecting the tissues of the mouth that do not heal within two weeks should be evaluated by a dentist. Oral cancer often catches the patient off guard. When thinking of cancer, many people do not think of oral cancer. Oral cancer can affect the tongue, bottom of the mouth, lips, and lining of the cheeks, among other areas. Oral cancer may occur near leukoplakia patches. Leukoplakia patches that are near cancerous areas may show precancerous cell changes. To prevent the development of abnormal or precancerous cells, leukoplakia should be treated as early as possible. Most cases of leukoplakia can be treated by either eliminating the irritation causing the patches to form or through a surgical procedure. Tobacco use such as smoking or chewing tobacco can cause leukoplakia. Ill-fitting dentures may also cause leukoplakia to develop. In cases where tobacco use is the cause of leukoplakia, no longer smoking or chewing tobacco may be the only treatment necessary. Dentures that do not fit properly may irritate the gums, lining of the cheeks, or the tongue. Improving the fit of the dentures can eliminate the irritation causing the leukoplakia patches to form. Leukoplakia patches that show signs of cancer must be surgically removed. An oral surgeon will use a scalpel or a laser to remove the leukoplakia patches. To learn more about leukoplakia treatments, or if you would like to schedule an appointment, please contact the oral surgery practice of Dr. Bird and Dr. Johnson today.